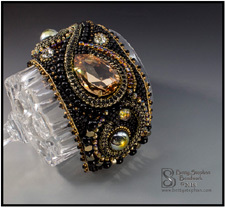 Betty Stephan’s beading classes are focused on learning but at the same time are relaxed and a lot of fun! 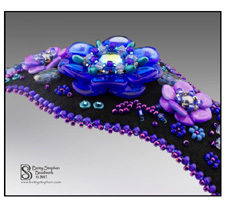 Her years of beading experience and the detailed, illustrated instructions provide the guidance needed to finish her beautiful class projects. Betty has won numerous international awards for her bead embroidery and has been published in several books and publications. 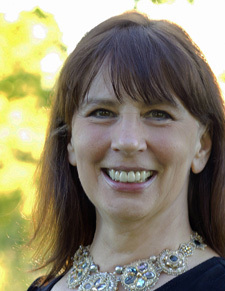 Her necklace “Cathedral Windows” is pictured on the cover of “500 Beaded Jewelry” and she was one of 30 featured artists in the book “Marcia DeCoster Presents”. 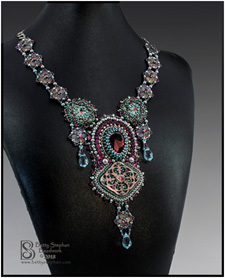 Her collar, “Carousel of Time” won 3rd place in the Bead Dreams competition (Seed Bead category) in 2015, and her necklace, “Changes” won grand prize in Bead Star competition in 2014. She designs for the Beadsmith as part of the “Beadsmith Inspiration Squad”. She also teaches nationally and exhibits at Fine Craft shows throughout the year. When not teaching or designing jewelry in her western New York studio, Betty and her husband travel around the country in their RV--fully equipped to bead as she goes!